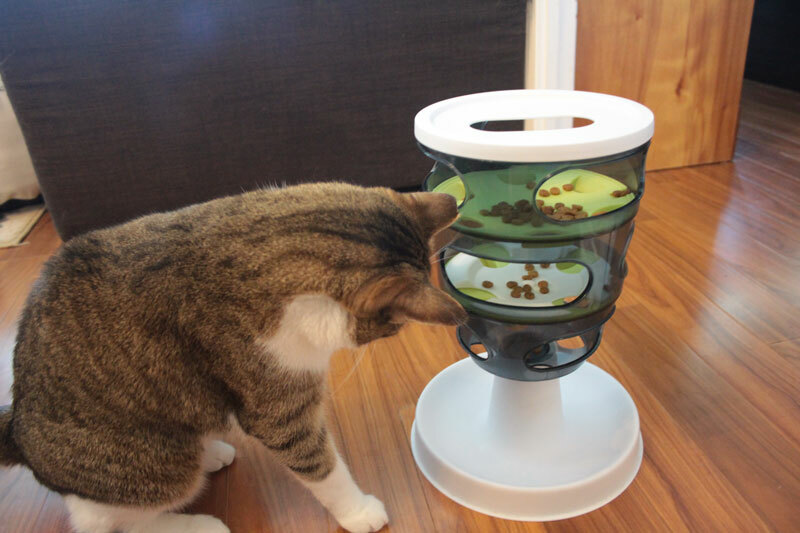 Our Favourite Cat Puzzle Feeders to Keep Your Cat Busy! 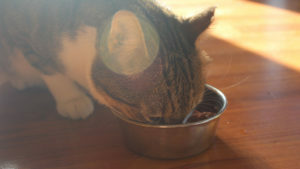 I’ve always been a huge fan of puzzle feeders and interactive feeder toys, especially since one of my kitties has Pica. Although my cats have been switched onto a primarily wet food diet, it doesn’t mean I stopped using feeder toys for what little kibble I do feed them. So I thought I’d compile a list of my favourite puzzle feeders, some which I’ve tried and some which I really want to try in the very close future. If you’re new to feeder toys, welcome to the awesome work of keeping your cat engaged and entertained! Feeder toys have been part of our lives for about 4 years now and have really saved us from a lot of problems. We originally were interested in feeder toys because our cats were eating way too fast and would throw up. We also noticed that although Walker knew how to ration his food out throughout the day (as he was originally open fed), Beau would scarf down as much food as he could even if he was still full. As soon as we started using toys such as Catit Senses 2.0 Feeder, Beau would actually ration his food out over 18-hours, which was quite impressive for such a piggy kitty! I’m going to start off strong with a product I own which is an absolute blast for both of our cats. My sister actually gifted my cats this amazing activity centre which features 5 different ways to play. This activity center helps teach your cat how to scoop out food, move food between pegs, slide food between wavy ridges, claw out of small holes and paw into an enclosed area. 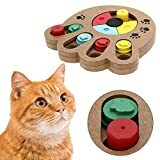 It’s been one of my favourite toys to use with my cats and is very suitable for beginner puzzle solving cats! I cannot recommend this toy enough! While this toy won’t get your kitty to run around or lose weight, it does provide a fairly complicated series of puzzles they must solve to get their food. 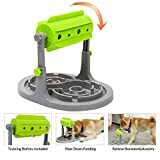 We have a toy similar to this one which took Beau a few weeks to figure out, and while Beau is fairly quick at learning how to play with new toys and feeders, these ones provided him with a great challenge (which I thought was great.) This toy will teach your cat how to slide open areas, pull on strings, pull on levers and remove objects from their enclosures. 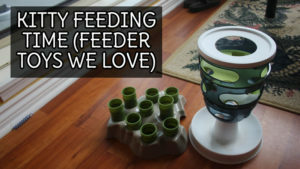 I would recommend a toy like this for intermediate cats who have tried out a couple of feeder toys prior, however, your cat may be the genius this toy needs! Similar to the toy above, this is a less intricate feeder toy that teaches cats how to slide doors to get the food that they want. It’s a very, very reasonable price and is a great introduction to cats who have not been previously introduced to feeder toys. It also comes in two delightful colours. This toy really resembles a thrill ride. Food is dispensed when your cat hits one of the lips of this toy. What I like about this toy is the fact that it has multiple sized holes for both treats and food. 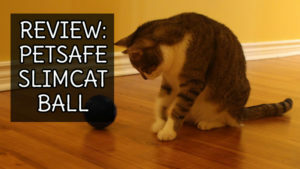 My only concern is that the holes are going to be too big for the kibble causing them to just fall out, similar to the SlimCat ball, although we found a way to quickly solve that problem. My absolute favourite thing about this toy is the fact that it also features a puzzle tray, which in itself can be a fairly useful feeder toy. My only other concern about this product is whether or not this toy will continue to spin or if there’s a chance that it will stay facing down and drop the majority of your cat’s food. It somewhat ties to the above concern, however, I would fix this problem with some tape on 3 of the holes (or two, dependant on how much drops.) It should be a fairly easy toy to teach your cat how to play with, especially since it uses the classic kitten bat that cats are so famously known to do! Although extremely simple, this is a pretty cool interactive cat toy. Using rungs/dowels to hide the kibble, this toy is a great introduction to feeder toys for cats. The issue with a number of feeder toys is the complicated nature that they present, and while some cats are able to solve complicated puzzle toys, it’s best to ease your cat in slowly so they don’t lose interest altogether. The makers of this toy recommend you use catnip to help introduce your cat to this product which may actually cause your cat to play with this toy even without food! This is a toy we actually have that I haven’t actually written a review for, because I’m still trying to get Beau to learn how to use it. This is an example of a fairly overly complicated toy that may have been too smart for its own good. I’d say Beau can get food out of this device about 1 out of 10 times (which isn’t a great ratio.) It’s not the fact that Beau is “dumb” it’s more of an issue that the holes are much too small for his paws. Beau finds it easy to topple over the pegs, but as soon as they are toppled over he struggles to get the food out of where they are placed. It also seems like the slides hide the scent of the kibble, which isn’t so great. The only way Beau knows the food is inside of this toy is when I start moving the slides. 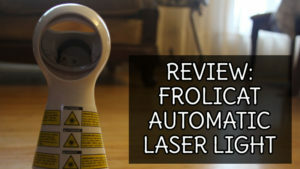 I’ll be honest and say I cannot recommend this toy, and will definitely give you a full review as soon as possible with videos of Beau using it. I’m actually so sad to see such mixed reviews of this toy since it seems so cool. I would definitely put this high up on the list of “very complicated toys” for your cat to play with. Although the lids on the beakers can be left off (so it’s easy for your cat to get access to their kibble) it seems like the lids make it extremely difficult for cats to get to their food. The issue is that with the lids cats must balance the beakers to make them drop food and if smacked too fast or rough, no food will be let out. Many cats have been known to get frustrated with this toy and have in turn knocked it over making it as some reviewers describe “useless.” I would say this toy is for cats who have a lot of experience with feeder toys and need a big challenge. Those would be a lot of fun…Pipo has some kibbles/treats in a cardboard toy, but he gave up after only a few moments. Even enticing him with catnip didn’t help…but then he is not the owrld’s biggest niphead. He might do better with rolling dispensers, but then Dalton would be all over it in a flash. Ah, we’ve had a few cardboard toys for Beau. The only thing I didn’t like about them is how much the cardboard absorbed the oil from the kibble, so we were always changing out the toys. Definitely a huge fan of the slim cat because of the rolling action! These all look like fun for kitties. I’m sorry, I’m laughing because the very first photo that you have there with the feeder is the one that Cody knocked over and got the treats out of (HIS WAY) after 5 seconds…………to see MY favorite puzzle feeders, read about Bat-A-Rat on my blog and the Cat Amazing Epic…those are my personal faves.